As a young student-teacher, I was most fortunate to be introduced to Vedic Mathematics* at an early stage in my career. Much has been discovered in the class-room of the beauty and intelligence of this remarkable system and I hope to share some of these insights in this article. Whilst the magic of Vedic Mathematics can often be used to raise the enthusiasm of a flagging class or to maintain the interest leading up to the end of term, nevertheless the most significant part of the study of Vedic Mathematics*, in my view, has been the general effect on the teaching of mathematics. Experience shows that Vedic Mathematics has much to commend it as a paradigm for teaching. The 16 sutras and sub-sutras are a unique way of encapsulating a process in a verbal statement. For instance, the statement "Vertically and Crosswise" contains the essence of the process and at the same time acts as short, verbal reminder. According to Katyayana, "A sutra is of the very fewest syllables, unambiguous, expressing the essence of a subject, of universal application and agreeable to mind and tongue." Certainly, many of the Vedic Mathematics sutras meet these criteria. This will often be stated as "The area of a triangle is half the base times height". Some students, being less comfortable with an algebraic formula, are quite at home with a verbal statement. Children enjoy developing their own word formulas. For instance, one class came up with the statement for rounding numbers, "If the next digit is five or more, increase by one, the one before." This was unnecessary for some but for others, who were struggling, it made the whole operation a lot easier. B) Demonstrating first and explaining later. A good example of this is the Nikhilam method of multiplication. Bharati Krsna, whilst giving the algebraic explanation early on, does not dwell on it. He spends most of the time going through examples and this is preferable for most learners, especially young ones. In practice, I have found that students are very happy to experience the magic via a large number of examples before enquiring about the logic. When their experience has built up then students are much more appreciative of the logic. In the meantime, they are growing in confidence and in the understanding of number in practice. The example that comes to mind here is multiplying by 9, 99, 999 etc. Bharati Krsna, in chapter 2, encourages the reader to look at a table of products using a single digit multiplier of nine. He then extends to 2 digit multipliers and notes the rule holds good there as well. This procedure is the basis of investigation, very popular in schools today. Investigations inspire enthusiasm and lead the pupils to look for themselves. This is an important element of practical work in science. which he says "should be a short and simple mental process." But he does insist on practice to gain "mastery over it"! Solving equations by this method is very effective but in the present climate of educational opinion, not one that is appreciated by examiners or teachers brought up on the traditional methods. Examiners do like to see some recognisable working written out, otherwise students may be penalised. We do not always insist on proving formulas however. Students commonly use a formula for the area of a triangle without having to demonstrate a reason for its validity on every occasion. For some students, being able to find the answer to a simultaneous equation simply by following a rule is very advantageous, whilst others prefer to see how the method works at each stage. Vedic Maths offers the opportunity for both. This, for me, has been one of the most useful tools for teaching mathematics from Bharati Krsna's book. I have used it with great effect on many occasions when introducing a new topic. Once again referring to chapter 11, Bharati Krsna begins by developing a formula for equations of the type ax + b = cx + d as previously mentioned. In a similar way he develops a formula for type 2 which is represented by (x + a)(x + b) = (x + c)(x + d). Type 3 and type 4 follow and formulas are developed in a similar way. The point I wish to highlight is the use of the staged types of equations, with each type being either a little more involved than the previous type, or a development from it. I have used this successfully to introduce a range of topics at all levels of teaching mathematics. Take basic percentages for instance: type I might be learning to express one quantity as a percentage of another. Type 2 might be finding a percentage of a quantity. Type 3 might be increasing or decreasing by a percentage and type 4 might be finding an original amount, knowing an increased or decreased amount. The actual types are not important. What is important, is giving the students a sense of a structure which is progressive. This is enormously beneficial for students and gives them confidence when learning a topic for the first time. This, for me, is the most revolutionary part of the whole of the Vedic mathematics approach. I have used this on occasion over the years, but only with bright students, and then in limited circumstances. When using it, much practice is required in transposing numbers from one form to another. This is a brilliant example of Vedic Mathematics using something that is well known but overlooked. For those of us old enough to remember, bar notation was used in logarithmic calculations. The use of the vinculum is obviously at the heart of many mental strategies. For instance, adding 29 to 56 we add 30 and subtract one which is basically adding 3 bar 1. How much easier it would be if students were brought up on this concept from an early age. I now find that Vedic Mathematics, rather than being a bolt- on, fun option in my teaching, actually pervades and supports the whole of the teaching from the very centre. I may not teach Nikhilam multiplication to every class but the principles underlying Vedic Mathematics are still there at the heart of my teaching in every lesson. For this I am extremely grateful. An Online educational portal and Virtual campus with state of art technology was founded few years ago. The vision of this virtual learning platform is "to create an Online Oneness platform for free exchange of Ancient Indian Sciences". It has offered dozens of free online Webinars/Online conferences/e-courses and also has introduced many expert trainers to the world of e-learning technologies. They are looking to become affiliated to an established University, for the mutual benefit of both. If you have any suggestions or contacts that can help this to happen please contact Venkat - . This online teacher training course in Vedic Mathematics started on 2nd October and is going extremely well. The extracts below from Forum posts will give you some idea. "Lesson 17 on Natural maths was fun. After watching the video, I prepared the following worksheet, based on the video and tried it with my topmost GCSE group on Wednesday , the 9th November during my one hour lesson with them. I gave them 45 minutes to do the work and then explained all questions to them by Vedic Maths method quoting the sutras - "Spot the obvious and If one is in ratio, the other is zero". They were amazed and would never forget the lesson for rest of their life because they had really struggled doing the questions by normal methods." "I started teaching few simple VM sutras to my 7 year old - multiplying by 5 and multiplying by 11 (my assignment 1) and she gets so excited and can't wait to learn all of VM. She keeps asking me when will i do my next VM online class, she wants to listen with me. I truly believe kids get more interested in maths because of VM." "I have found that VM has opened my mind and expanded the possibilities when dealing with different maths problems. Some of the examples in the spot the obvious part of the lesson I was able to quickly pick up. Prior to learning about VM, nothing would have been obvious, nor would it have been spotted. This expanded vision and opened mind allows one to work a lot smarter, with minimal effort." "I just finished the 17th lesson , and I think it really applies to the whole life and not just only math, it gives us a hint about problem solving and being flexible with the solution so that we find multiple ways of getting out of a problem , as they said " the more flexible always control the situation. 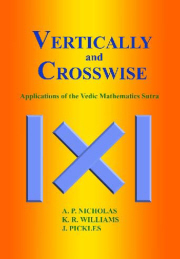 Also I like the versatility of Vedic math as Andrew mentioned earlier , it gives an impression of being free rather than being limited to one way of solving, just in case of multiplication like 16*18 I solve it with about 4 method : as 10 base , 20 base , vertical and crosswise and by adding and subtracting , it gives you the feeling of control for solving." "I have also received responses like "why are they not teaching this in all schools?" or "I wish I was taught this system when I was in school" or "I feel ripped off for not being taught this way," which were also my responses when I stumbled upon VM. I think as trainers in training we not only need to learn the methods well to be able to teach, we need to go that little bit further to understand how and why the methods work in order to deepen our own understanding and in time that of the people we will be teaching. As someone once said: 'The difference between ordinary and extraordinary is that little extra'." "Over thinking is not necessary. That is what Vedic Math shows us. Over thinking is the conventional way. Vedic is about working smart, not hard." "I was watching my lessons 13, 14 and 15 and my daughter asked me to teach her that. So I went ahead and taught her hardly for 5 -10min "multiplication near a base" and so surprised to see that she got it right away! She is going to be 7yrs old in few months. She said- I made a connection. She has been asking--- is there a 7 point circle ?, 6 point circle?" "Really exciting to learn the powers of VM techniques. When I shared near base / proportionately methods to 3 kids (neighbours), they are so enthusiastic to learn all the techniques immediately!!" "Was showing my 11 yr old the method of subtracting from base numbers (all from 9 last from 10) and he got it right away. I started with lets race and I got it faster each time. Once I explained he was so excited and wanted already go talk to his teacher and of course show off with his friends. I also walked him through adding fractions and I think I already have one person completely sold on this topic. I asked him to wait until I go through all me classes and give him all the basics in order. But I definitely see the excitement and hence acceptance the system can bring in. Enjoying every moment of the learning.."